Webster Lake Vacation Rental #7618 LakeHouseVacations.com Rent Me! The outdoor deck just outside the kitchen is a popular spot for visiting with family and friends. 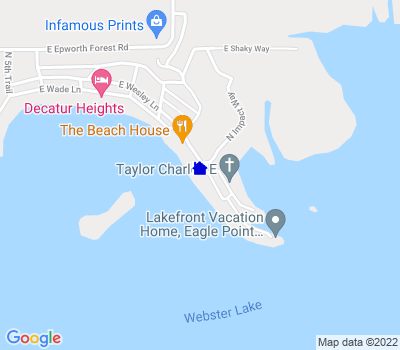 This Lake Webster vacation cottage rental has 50 feet of prime lakefront that is good for swimming, and also immediately adjacent to the best swimming beach on the lake (Epworth Forest swimming beach and beach house). It is an old school vacation cottage rental with tons of charm. It has been owned by the same family since its construction in 1923. Lake Webster is about half way between Fort Wayne and South Bend, Indiana. It is in the Kosciusko County Lakes region, which serves as the vacation destination for Indiana, Illinois and beyond. Many regulars come from the Indianapolis, Fort Wayne, South Bend, and Chicago metro areas. Webster Lake is close to Barbee Lake, Lake Tippecanoe (Big Tippecanoe, Little Tippecanoe, James Lake), Lake Wawasee, Syracuse Lake, Chapman Lake, Dewart Lake, and many others. Fully-outfitted kitchen: Refrigerator, Cooking Utensils, Stove/oven, Coffee Maker, Microwave, plates, toaster, etc. Just bring your bed linens, towels, food and beverages .1 queen,3 full size beds. Outside: pier to tie your boat, fish and swim off of too. Just down from Epworth Forest Camp and Conference Center beach area. Webster Lake is an all-sports lake. Boat and pontoon rental are nearby. Fishing, Golf, Groceries, Swimming, Hunting, Water Skiing, Sailing, Jet Skiing, ATM/Bank, Tennis, Bird Watching, Walking, Restaurants,Shopping, Antiquing, Miniature Golf, Boating, Wildlife Viewing, Tri-County game preserve. Shipshewana, 40 minutes away. Webster Lake is known for Muskie and is consistently rated as on of the half-dozen best lakes in the country for Muskie. It also is good for bass and other pan fish. Special discounts are available to long-term renters. Deposits: To hold the desired dates, the rent and a $200 security and damage deposit are typically due upon booking the dates. Due to the inability to rent the cottage at the last minute, bookings are nonrefundable except at the discretion of the owner/landlord. This ad has been viewed 23604 times. "We rented this cottage/home in the 80's and love every visit. The deck was an addition that was added between the years of our vacationing there. The cottage's lake front is all windows that provides great evening view of the Dixie boat,remember to flip the porch light on and off for the captain. Hope you all have the many, many family memories this Lake and cottage has given our family.